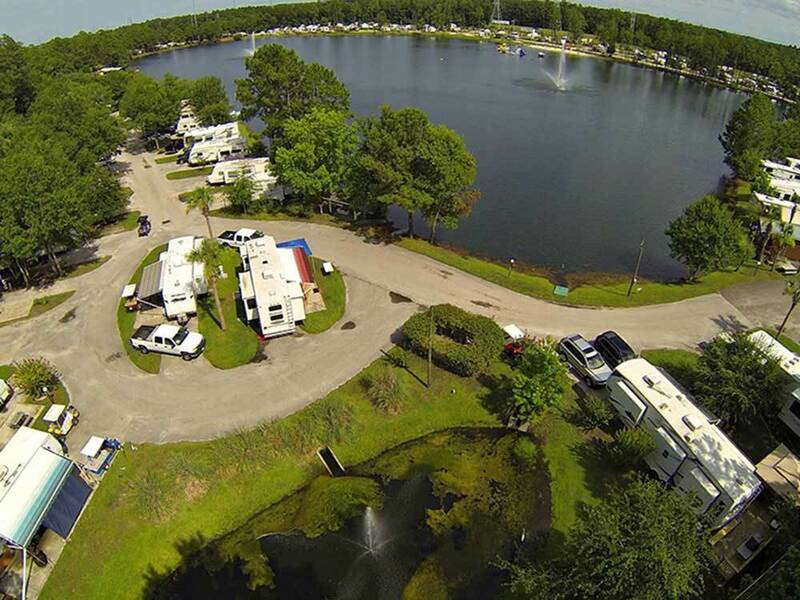 A beautiful park, manicured around a 17 acre lake, pristine seclusion, minutes from beaches, airport & downtown, but you won't want to leave our onsite beach, water toys & restaurant. Studio to 2 bedroom fully furnished, full access to all park amenities. I can truly say that this has been our favorite park to date. We meet great people, were treat great by the staff and enjoyed a great meal at the Sun Rise Cafe. There are two sides to the park. One side is paved and the other is not. The paved side seemed to have an older crowd in it and the other side, which has an awesome water park seemed to have a young crowd. I would have stayed in either side but was glad to have gotten a sight on the paved side. The pond was full of fish, the pool was clean, the general store was well stocked and the Sun Rise Cafe always put out a good meal. Enjoy and stay a while. We will be back! Forget the negative comments. If you are a reasonable person and you can get a site, you will have a nice time. I secured an overflow site without sewer on short-notice, but I was fortunate enough that they had an extra site with hookups when we got there. It was a great time; staff and residents were welcoming and friendly. I had to get pre-approval for our large breed dog, but everything worked out. We would definitely stay again. Stayed over the weekend for a wedding. The staff/employees were very pleasant however there are way too many permanent people with excessive plants, furniture and built up decks. The pictures on the website and on the this Good Sam site are not how it looks anymore. Sites are a bit tight also. This campground was beautiful. Stayed here two nights to visit some friends. Asked for a site next to the lake. Was rewarded with a perfect site. The lake was a definite hit with my grandkids, 5 and 6. They had a fantastic time playing on all the toys. they also rode bikes around the campground. Did not use the restrooms, so cannot comment on them. Was treated very well by all the staff. Only comment negative is the price for visitors to come and visit you. I can understand people that come to use the facilities, but to visit a camper should be relatively cheap. We will stay here again whenever in this area. We arrived at Flamingo Lake late and was told by the security guard that we could not check in for a one night stay, but we could park across the street in an open field. The next morning I visited the office and asked if I would be charged for the night since I was not allowed to go to the site and was informed that I would not. When we returned home I check my CC and noticed a full nights charge from Flamingo Lake. I called and was told that I didn't show up so it was considered a cancellation. After reiterating what happened I was told that since I showed up after hours it was considered a no show. I then asked WHERE that policy was posted and no one could point me to the information. Not very good customer service. We chose Flamingo because our son was having surgery at Mayo. We wanted something close by. We arrived after dark and was escorted to our site. This was nice because it was dark and they have little lighting around. The older gentleman helped us back up. The ladies in the office were not very personable. Maybe that is just how some are. They were not overly rude but just not very informing or seeming genuine in greeting. It was late maybe they were tired or had a bad day. Also, didnt inform us that they charge extra for even your own children. We have a 12 year old daughter. I think you should be able to have at least a family of four stay at price or children under age 16. Although, i suppose it might be written somewhere i have to look but theu should let you know, too. We are usually a family of six; defiently would not stay at the extra prices. Flamingo at the time was doing repairs to some sites where the trees roots were growing thru. In areas they have worked is looking good. Still a lot of work to be done but its getting there. Also, those who live here, snowbirds or monthly renters should be made to follow the rules, also. So many sites were covered extensively in plants and things. There is suppose to be no dog pens outside but there were several. Although, they do have a nice dog area to let dogs play. Also, the site we were on the cable didn't work. The ladies in office didn't let us know but the neighbor that lives here came over to let us know and let us work off theirs. Nice neighbor but neglectful of office to not let us know. When they know. Especially, since they say you have cable and they know there is a no refund at all policy. They have activities. We did play bingo which was nice. I don't know if we would stay again because of the extra prices and close together sites. It was alright for a week but if it is busier during the summer I think it would be overwhelming. Hope you enjoy my review and prayers for fellow travelers. We stayed in this campground in conjunction with visiting friends in Jacksonville. This campground is HUGE. It must be absolutely crazy when it's summer and the kids are zooming all over the lake play spots. Accordingly, the camp spots are a bit cramped since this campground seems to be seeking "crowds." They even have periodic/weekend bands to attract crowds. The bathrooms were ok but the one we used (closest to the main office) could use some updating. The best feature of this campground is in the on-site cafe that serves a great breakfast (eggs over easy with ham and hash browns? No sweat) and sits on the edge of the lake. I was pleased with being escorted to my site, it looks like a very fun place in the summer, with all the lake activities there. Sites are small. They should have the long term guests keep there areas clean and appealing. I really liked the restaurant there, good food, good prices. Overall nice. Traveling in an RV is such a great experience. However, it’s every RVers nightmare to stay at a place where the shorter termed customers are treated like second class citizens. It’s also greatly disappointing to see that some RV parks think they never have to provide a refund, even when they have failed to provide an adequate site. I was not told my site would be kept underwater. I had a right to expect it to be dry, or at least, not be the site where they repeatedly pump in excess water from the pool area. And by the way, I do have photos of this aquatic boat slip experience. While the manager never came over to our site, and was never around when I went to the office, I do believe him from our phone conversations that he was not allowed to give refunds, for any reason. I believe that’s a reflection of management enforcing unfair business practices at the Flamingo Lake RV Resort. The industry works so hard to provide excellent and fair service; however, you make it, and the Jacksonville, FL. area look bad. You had no right to charge me for such an inadequate service, you never bothered to reply to my letter requesting a refund, you are an example of the negative side of this wonderful and fun industry…shame on you!! Don't have an RV but still looking for the relaxation of camping? We have a wide variety of fully furnished cabins that will allow you the opportunity to enjoy all of the fun of camping! Take a look at our selection.